As the red-wine harvest draws to a close, there’s a sense of relief and quiet satisfaction in Bordeaux, if not the euphoria of a great vintage. It has been a long season and nerves have been frayed right to the end: we’ve had what seemed like three seasons in the space of two weeks. What should be picked and when? ‘The weather doesn’t know what it’s doing’ said Lilian Barton at Langoa. ‘I wonder if weather forecaster is the only job where you can keep making mistakes and still never get fired’, tweeted Frédéric Engerer of Chateau Latour. Three weeks of October sunshine were too much to ask for in the end, and that’s the problem with comparatively late harvests. After a delayed start and a wet spring, Bordeaux had already had its fair share of luck, with two months of fabulous summer sunshine right up until the last week of September. Since then it’s been a bit up and down. If any grower says they were able to pick ’a la carte’ (as and when they liked) then they must be talking about the dry whites, which were harvested under clear skies in until the last week of September. That said, the Merlot and Cabernet grapes I’ve seen on the sorting tables at the leading estates, from Pauillac to Pomerol and from Margaux to St-Emilion, have been in remarkably good shape. They don’t have the joy, the concentration, or depth of flavour that you find in great vintages, yet they are healthy, thick-skinned and tasty. The question now is the quality of the tannins in those skins and in the pips – château by château, block by block. As for vinification, gently does it. 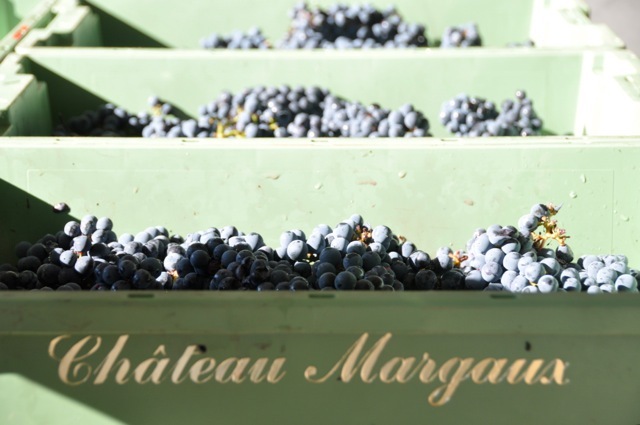 The first serious appellation to harvest their Merlot is usually Pomerol, along with parts of Pessac-Léognan, and they didn’t begin in earnest until the first week of October. Petrus were working on their old vines on Friday 5 October when I popped round (as you do) to see bunches of pristine Merlot arriving in their new reception area. It was hot work for the pickers outside in the 28˚C heat. Before then, it had been unseasonably quiet in the vineyards around Bordeaux, with the crus classés of the Médoc also bringing in their first merlots at a leisurely pace during the first week (see my 5 October report). Then on Sunday the 7 October we had some unscheduled rain (hence Engerer’s tweet). Not a vast amount and probably not enough to stand out in any weather charts but, coupled with the tropical humidity we had over the next few days, enough to create perfect conditions for the dreaded botrytis (dreaded for Merlot, that is, not for sweet white). There is nothing more likely to send vignerons scrambling for their tractors and harvest machines than the prospect of imminent rot at harvest time, and so it proved. Cue lines of trailers at the co-operative in St-Emilion and far beyond. Further up the limestone slopes, and higher up the food chain, the premier grand cru classés of St-Emilion also began en masse, with some bringing forward their start dates by a few days. By midweek, most of St-Emilion was in full swing. ‘The Merlot is ready now but the Cabernet Franc isn’t ripe. 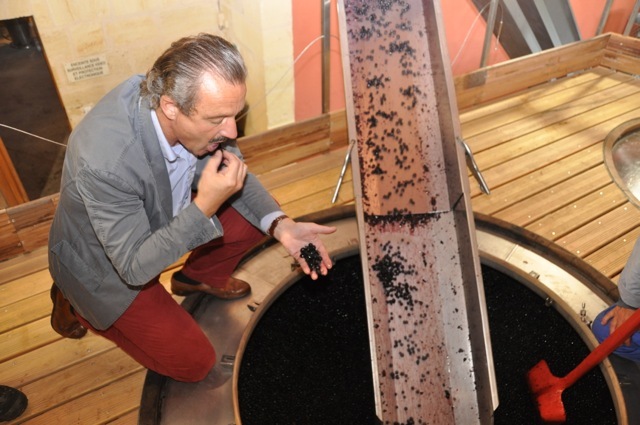 We need to wait a week’, said Stefan von Neipperg as he presided over the harvest at La Mondotte, one of two of his properties which were promoted to premier grand cru classé in September. Other PGCCs, like Troplong Mondot and Beau-Séjour Becot, also started on Wednesday 10 October. ‘The Merlot was looking très jolie and we would have started this coming Friday. With this humidity and warm nights we cannot wait’, confided a cellar master. Then the weather changed and the temperature dropped. On the Thursday, by way of example, I harvested some Merlot, and the juice at 7am was 17˚C. Doing the same on Saturday, at the same time, the juice was at 6˚C. The cold snap should at least have inhibited the spread of botrytis. At many châteaux, the array of new sorting machines and new-fangled destemmers is mind-boggling. The same is true, incidentally, of the Right Bank: even small St-Emilion cru classés now have optical sorters. Bordeaux, at this level, has changed enormously in the last five years. 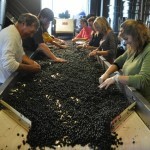 2012 has all the hallmarks of an older-style, classical vintage – October harvests for both the Merlot and Cabernets were not unusual in the past. We can expect yields from leading Chateaux to be low, however, and stricter selection for the grands vins might affect the volumes further. 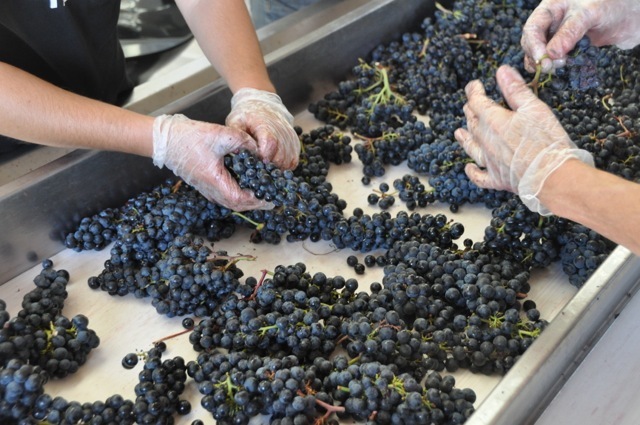 With lower yields nowadays, better viticulture and precision sorting – let alone technological advances in winemaking – it will be fascinating to see how the wines turn out. As for the market, that’s an entirely different matter. A bloody good read! Thanks for allowing us to "pop in" on the Bordeaux scene. Thanks Paul, I hope you're both well.